"Whether all grow black, or all grow bright, or all remain grey, it is grey we need, to begin with, because of what it is, and of what it can do, made of bright and black, able to shed the former, or the latter, and be the latter or the former alone. But perhaps I am the prey, on the subject of grey, to delusions." "I do not know whether behind appearances there lives and moves a secret essence superior to me. Nor do I ask; I do not care. I create phenomena in swarms, and paint with a full palette a gigantic and gaudy curtain before the abyss. Do not say 'Draw the curtain that I may see the painting'. The curtain is the painting." There is nothing behind the curtain, or rather, if there is a curtain, one can only be behind it. Not observing, intently, secretly, with the shivery eyes of a Peeping Tom dwelling in the void of the unseen. But also not being watched, not being shrouded in surveillance and lingering in a hazy maze of gazes. There is nothing but the curtain, a monochrome reality, plain and obliterating, yet exhibiting structure and texture and preventing the light from taking its usual path of refraction. There is absorption and diffusion, saturation and scattered variance. Christopher Hanlon's Broken Vendor is a veil of the invisible and at the same time a pure, neverendingly recursive image: by painting canvas on canvas, Hanlon establishes the solidity of a tableau or screen, whereas we have to consider the possibility that it is doing anything but enabling projection. While the texture of the curtain implicates a certain kind of movement, as if it could be shaken by a sudden gust of wind at any moment, revealing whatever lurks behind, it simultaneously seems as if sculpted from marble, impenetrable – a curtain that could only develop cracks, which would then blend together to form a map of some obscure domain, or embrittle and chip like a wooden panel painting, but never rip like cloth. Transparency and opacity, serenity and suspense fold into one and in this respect, Hanlon's paintings can be perceived as 'monadic'¹. According to Gilles Deleuze, who has worked extensively on the interrelationship those monadic properties hold with art, "a painting always has a model on its outside; it always is a window … Folds replace holes … Essential to the monad is its dark background: everything is drawn out of it, and nothing goes out or comes in from the outside"². Against this dark background of theory, we can only perplexedly glance at Christopher Hanlon's curtain, which so adamantly refuses to let us take position and use his painting as a window. Some will remember John Lurie, who in Jarmusch's Down by Law glumly informs a grammatically confused Roberto Benigni that "well, in this case, you look at the window", after the latter has drawn a window onto the wall of their jail cell. There seems to be no way of determining where exactly the light is coming from, yet we see shadows creating folds which then in turn create the somehow impossible layering of Hanlon's paintings, in which a clear separation of foreground and background does not take place, but viscous, nebulous, cloudlike textures form both the foundation and the medium in which the spectator remains in limbo. In Untitled (Balloon Seller) the balloon seller's breath first dissipates the border area of light and darkness, where contrast and hence three–dimensionality is still possible, only to coagulate and become two–dimensional balloons, first of a bony white, but later, further up, an archipelago of colours riddles the ocean of darkness, as if colour itself is the shadow necessarily cast by darkness. "Out in the ruins he sees darkness now at the edges of all the broken shapes, showing from behind them." A much stricter, structurally condensed aesthetic of the fold can be found in the Untitled (Formation) paintings, which, just like the curtain, play along the strange loop of recursivity to delve deeper into being "mise en abîme". While Hanlon's curtain, in its monadic way, folds organically or naturally, the Untitled (Formation) paintings depict origami structures, for which Hanlon uses actual models, yet from time to time the blinking eye is lured into finding physically impossible angles and shadows in their geometrical twilight. The way in which his foldings' use of colour, viscosity, shade and translucency deals with refraction and absorption resembles the aesthetics of paper and folding we can find in Tanizaki Jun'ichirō's famous essay In Praise of Shadows , in which the author states that "the surface of Western paper seems to reflect the beams of light, whereas hōsho or Chinese paper imbibes them like a plane of soft, freshly fallen snow. If one touches it, it is supple and when folded, it doesn't make a sound. It feels tender and moist, as if one touches a leaf"³. 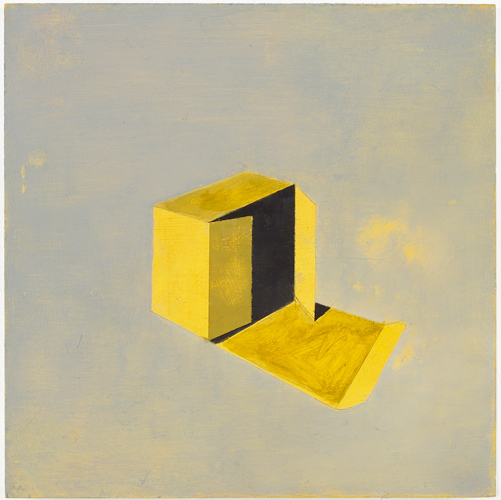 Thus, Hanlon's technique of double–folding by constructing an actual model – whatever kind of paper it might be made of – and painting, that is, transforming it again into a manifold of strata of paintbrush strokes, can be understood as a reflection (up)on absorption. The intricate foldings raise another question: What is it that has been folded and what patterns would reveal themselves once it is unfolded? The unfold is "clearly not the contrary of the fold, nor its effacement, but the continuation of extension of its act, the condition of its manifestation. When the fold ceases being represented in order to become a 'method', a process, an act, the unfold becomes the result of the act that is expressed exactly in this fashion"4. After being folded, the folded structure and its original medium no longer stand in a relationship of mutually reciprocal translatability, they become incommensurable, if only with infinitesimally small differences. We can see colour chipping off the vertices and light lingering like fog in the vortices of perspective. Again, the mind tries to unfold these formations, longing to discover maybe another image of a folded structure, and so on, ad infinitum, or to reveal crumpled patternings which might be read like a map, or a mnemonic omen. We must not forget, however, that these are paintings and as such are subject to physical processes along the axis of time, be it a straight line or an entity existing solely in the filigree formalisms of mathematicians or the circling solitude of the Large Hadron Collider. Some layers of paint will become translucent only after decades or centuries, details will disappear or linger adrift the ephemeral, while others might slowly open their eyes or jolt awake, somnambulists painting pictures of their oneiric underbrush with their lashes. "… and soon his shadow was behaving properly, though still a little creased. Perhaps I should have ironed it, Wendy said thoughtfully, but Peter, boylike, was indifferent to appearances, and he was now jumping about in the wildest glee." The looks we take at paintings like Flying Monkey fail ever to be close enough. They make us squint, yet we don't know whether it is because they are too murky, or too bright. Although objectively nothing more than a subtle mixture of colour, the pigments swarm and jostle like ants, suggesting this fabulous creature might not even be there, might just be a figment of our imagination. In this sense, Hanlon's use of paint and brush creates the same medial effect the television set once had – we are tempted to look behind or inside the haptic, yet smoky screen of the image to verify we didn't trick ourselves, or haven't been tricked: How did it get in there? At the same time, Hanlon's paintings evoke a sense of the sculptural idea of an immanent image, that stroke by stroke his brush is not covering something up, but, in the manner of an archaeologist, removing layer upon layer the deep debris of time hiding what's already there, rather than imagining an image ex–nihilo. We feel some kind of futuristic nostalgia for things that might not even have happened yet. The composition of paintings constituting the exhibition's or excavation's title contorts time and thus memory insofar as it lets us think about the questions that we haven't asked yet, by giving a simple, yet cryptic answer: Because you stood still. Now while we could ceaselessly ponder the implications of this alleged answer and wonder what we might have done or what consequences Hanlon himself drew from the fact that we stood still, we might as well take a look at Untitled (Stage) and cease to forget that Hanlon might actually not be talking to us, that he himself is the spectator or observer. Samuel Beckett's Film written in 1963 and filmed in 1964, and Ridley Scott's Blade Runner from 1982 both open (with) the same eye looking at us. Although the fluid film covering the eye acts as a mirror, what we see is not ourselves: reflection is deflected, inside and outside juxtaposed. And while the eye is probably the only parallel between Film and Blade Runner, it is eerily interesting to note that in latter film, the protagonist R. Deckard (read René Descartes) is being pursued by an origami–folding myrmidon… In order to understand why Hanlon's paintings, too, can be seen as film, we have to take a closer look at Beckett's Film. After the conceptually impossible first glance the eye throws at us, its lid closes, giving rise to an umbral landscape of wrinkles reminiscent of the textural folds we have already encountered in Hanlon's Broken Vendor. It is significant that Hanlon establishes theoretical implications of perception in the medium of painting that we would expect only to be possible in the medium of film. If we follow, as the camera does, the black–clad and faceless figure in Film, hobbling along the cobble stone pavement, into a building, fleeing up a flight of stairs, we find ourselves locked into a small obscurely lit chamber, intently looking over the shoulder of the still unidentified figure. Inside, along the walls, Beckett has placed three types of image: a mirror, a window, and a picture. That is, he has fragmented the concept of image into its three inherent concepts: reflection, permeance and representation, all of which we have already found folded into Hanlon's Broken Vendor. Strangely enough, after looking at Hanlon's paintings, the room in Film becomes familiar; yet it doesn't seem as if Hanlon has drawn inspiration from Beckett, but rather the other way around. The figure then proceeds by circling the room, carefully and awkwardly avoiding being seen by the different types of image; he discovers a blanket, with which he covers the darkly dull mirror, this deepest abyss of all, and sneaking up to the window, he draws down the ragged curtain. The curtain is simultaneously the folding shutter it is in Hanlon's painting and the shutter mechanism we find in a camera, and as such is not spreading a protective film of invisibility over the supposed inside of the chamber by installing a light/dark boundary, but exposing it, making it visible, like a camera obscura, suggesting, again, a juxtaposition or superposition of outside and inside. A snapshot continuum, a prism break. The figure then sits down in a rocking chair in the room's center, facing an image of an oddly squint–eyed face, a reproduction of a Sumerian head of God Abu from the Museum of Baghdad. Hanlon's largest painting Shame shown here in the gallery, of the head of the ancient Syrian pantheon – Baal – coincidentally, or contingently lets us marvel at a similar visage and were it not for the minuscule fragment of an earlobe peering out from behind it, suggesting a boy actually wearing the face as a mask, the autarky of the mask as a screen or frame would be ideal. But Hanlon's paintings, as well as Beckett's Film are not at all about perfection or a conceptually pristine approach to the pictorial. We discover a myriad of hints and tints, of quaint taints and masked marvels. After Beckett's figure has inspected the image for a while, he slowly gets up from the rocking chair, both him and we close in on the picture, and in a frenzy he tears it off the wall and rips it to shreds. A short vertigo of the camera later, he sits back down and what he sees, what we see, is the actual image: the vestige of the void. The head of the God Abu was so easy to rip up because it wasn't framed, and neither are Hanlon's paintings. We have already discussed the mysterious quality of Hanlon's imagery in depicting what seemingly lies beyond it. While the walls around Beckett's camera obscura have faded and obfuscated with time, the pin that has been holding the picture of Abu is now holding the temporal stillness of nothing, of an αχειρο–ποίητον, or not–handmade image, which has created itself: a visible blind spot, existent, just like Christopher Hanlon's work, because you stood still. ¹ From the Greek μoνἁς (unity) a term established in the natural philosophy and mathematics of pre–Socratic thinkers such as Anaximander and Philolaos of Croton and then later picked up by Renaissance and Baroque polymaths Giordano Bruno and Gottfried Wilhelm Leibniz, the latter of which developed a whole system of thought from the interaction of monads in his famous Monadology published posthumously in 1716. ² From Gilles Deleuze 'The Fold. Leibniz and the Baroque' p.30. The translation of what Leibniz calls the "dunklen Grund" or French "fond" of the monads with "dark background" is quite misleading, i.e. it does not capture the meaning of the German "Grund", which can be translated as either "background", which of course applies to the dimensionality of the image, as well as "foundation" or ultimately "reason". ³ From Tanizaki Jun'ichirō 'In Praise of Shadows' p.20. Translated by the author. 4 From Gilles Deleuze 'The Fold. Leibniz and the Baroque' p.40. Christopher Hanlon graduated from the Royal College of Art, London in May 2008. He was selected for New Contemporaries, followed by Anticipation curated by Catriona Warren and Kay Saatchi in 2008. This is his first solo exhibition of paintings. His work is also included in a group show at Galerie Chez Valentin, Paris, opening Saturday 21 February 2009, including: Edouard Archinard, Michael Bauer, Hans Bellmer, Jean Crotti, Marcel Duchamp, Aurélien Froment, Andrian Ghenie, Christopher Hanlon, Marcel Jean, Andrew Mania, Christopher Orr, Francis Picabia, Man Ray, Jacob Robichaux, Carl Van Vechten and Jacques Villon. Christopher Hanlon was born and raised in Plymouth. He now lives and works in Belfast, where he likes to drink strong tea (strong enough to trot a mouse on) and look out of the window. Paul Feigelfeld was born and raised in Vienna. He now lives and works in Berlin, where he also likes to drink tea and think about things like China, Mathematics and which place on Earth to go to next.